If he ever had any doubts about the value of updating and maintaining his extensive portfolio, writes Kurt Kraisinger, this project and his clients' desire to weigh every possibility put them to rest -- with beautiful results. They say a picture is worth a thousand words. In the case of this project, that old truism was right on the mark. From the start, what my clients seemed to want most was to look at every image I could muster and ask questions and make comments about each one. And it worked: Through their words and body language during these sessions, they offered me almost all of the information I had to have to deliver precisely what they wanted. And that was great, because when I arrived on site, the lot had been completely scraped to make way for the house. 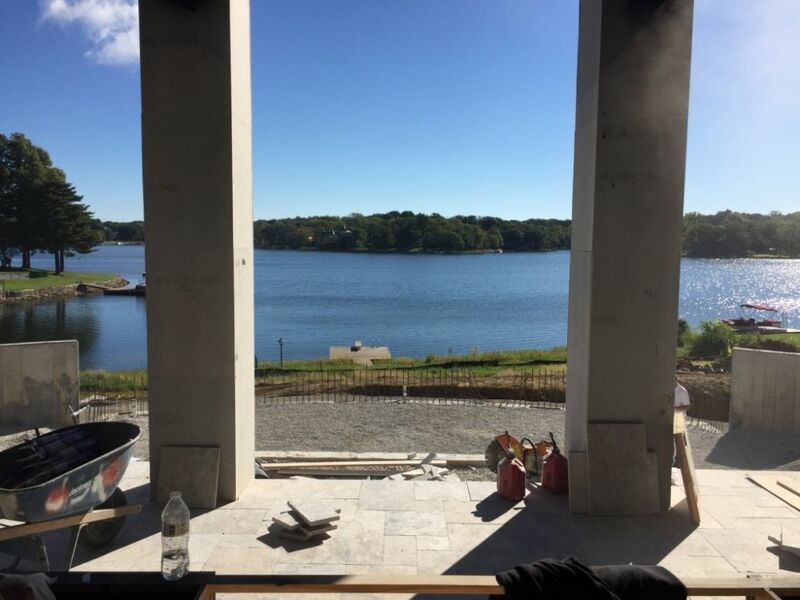 Without any structures there to balance my response to the site or key my conversations with the homeowners-to-be, I had to rely on plans and renderings and their feedback about my portfolio as I weighed the possibilities. In an odd way, this was a great experience – and a fair reminder that, as a designer, I need to be patient with clients who might not be very quick to see what I mean with my sketches, drawings and plans: Even with experience and training, working with an utterly clean slate in every detail of scope, scale and materials can get interesting! 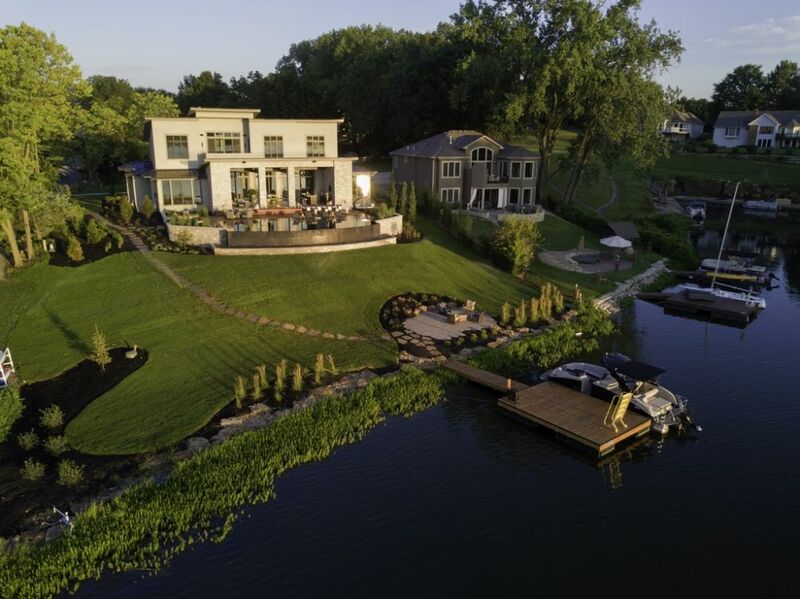 The cleared lot was situated on the water in an old Missouri community called Weatherby Lake. When development started many years ago, most of the homes were no more than weekend getaways – basic fishing cabins. In recent times, however, sights have been set higher and the area is now dotted with million-dollar homes and affluent, full-time residents. The result is an eclectic neighborhood, a mix of old and new, small and large, humble bungalows and stately mansions. When we came aboard, what we knew was that the home was to have a basically Contemporary look – nothing rigidly formal, just clean, clear lines defining an artfully complex set of elevations, planes and finishes. The clients had found us – Lorax Design Group of Overland Park, Kans. – through a referral, but it was clear they’d also seen our work published in local Kansas City media. From the outset, they wanted me to guide the process and were mostly interested in their options and how everything would come together. The clearest message was that they wanted something out of the ordinary for the area. 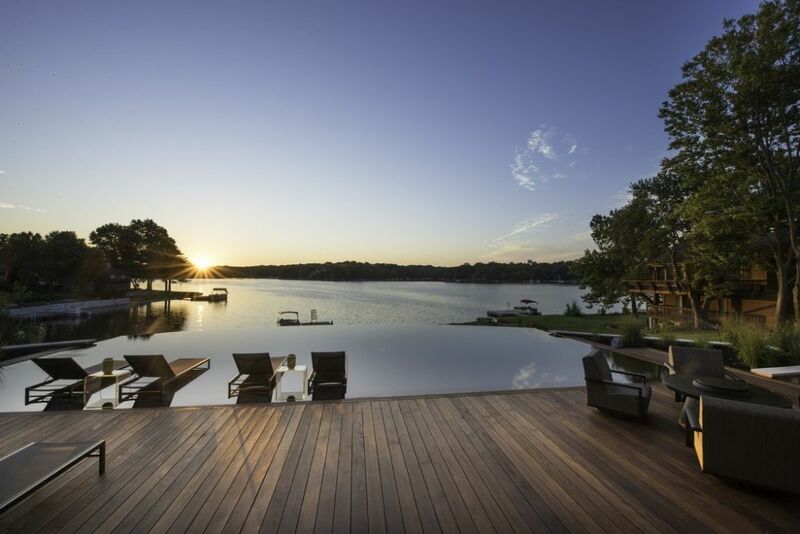 With that in mind, I showed them many images of perimeter-overflow pools, which are rare hereabouts, and they eventually gravitated toward a combination of that look along with a vanishing edge that would tie their deck visually into great water-on-water views of the lake. 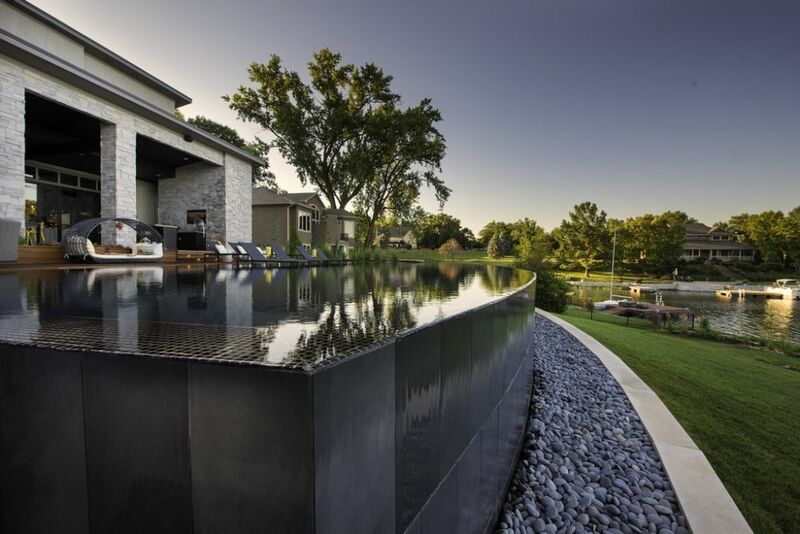 It helped that this combination was a perfect fit with the sleek style of the house; they also liked the idea that I could build the project through my construction company, Liquify Pools. 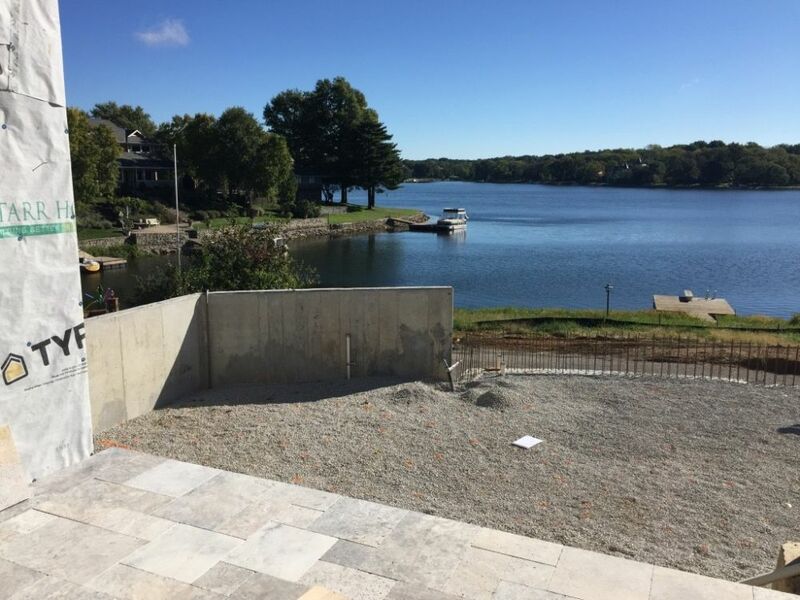 We started our work on site soon after home construction started and began by inserting – with participation of the foundation contractor – a containment wall that tied directly into the home’s structure and dug into the slope, effectively isolating the pool from any influence of the lake below. As mentioned above, photographs of our other projects were an important design tool here: Although the clients were well prepared and informed, just rolling through the images seemed to ease the level of stress that often arises as things get real in the decision-making process. In just two meetings and about two total hours of valuable conversation, I came away knowing what I needed to know – and they were fully satisfied that I knew the community and had a clear sense of the possibilities. What I shared with them soon thereafter was a fully integrated site plan that worked with the property from the edge of the patio down to the water. We were to handle the hardscape related to the pool; another firm came in and took care of the greenscape, ultimately sticking fairly close to our original layout. 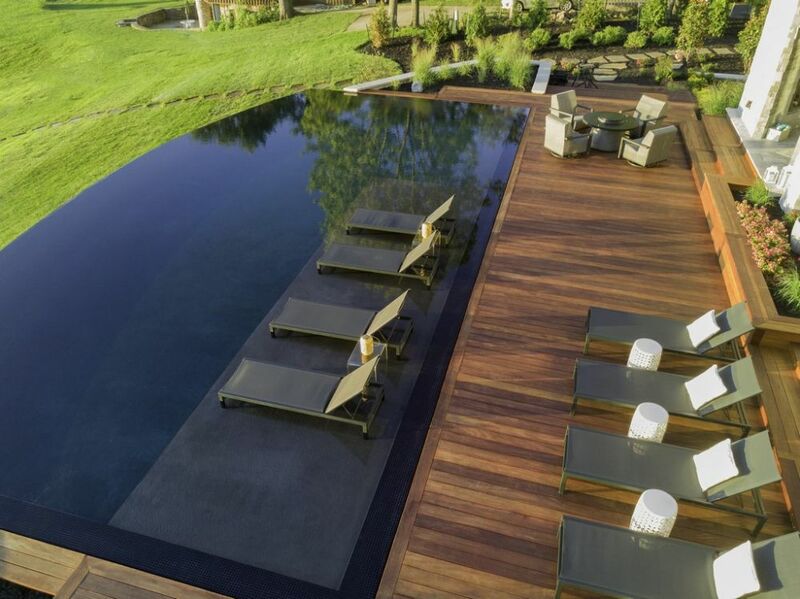 Just two full versions of the design were ever in play, one with an in-pool spa and – the winner – one without it. 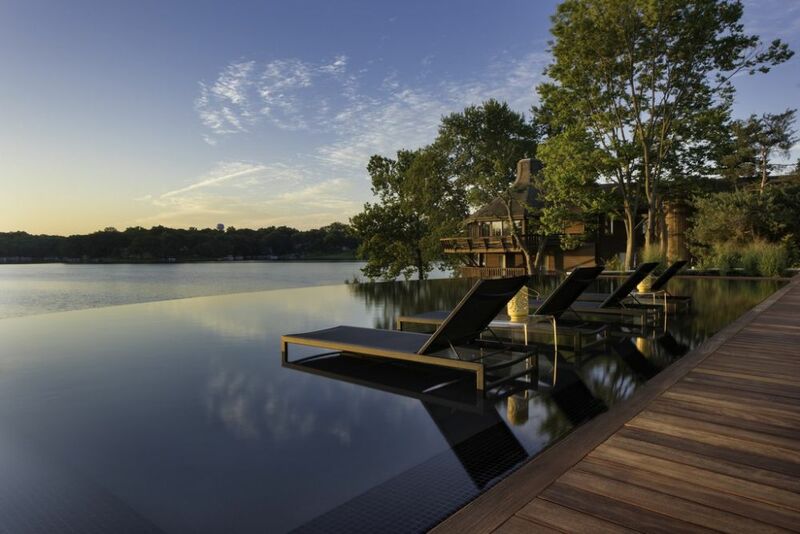 The key detail in the design is the big, sweeping edge overlooking the lake: It would’ve been simple to square things off and tie the pool more directly into the linear features of the home, but the opportunity to have the broad, friendly arc of the pool reach out to the water beyond was irresistible – and an easy call to make. 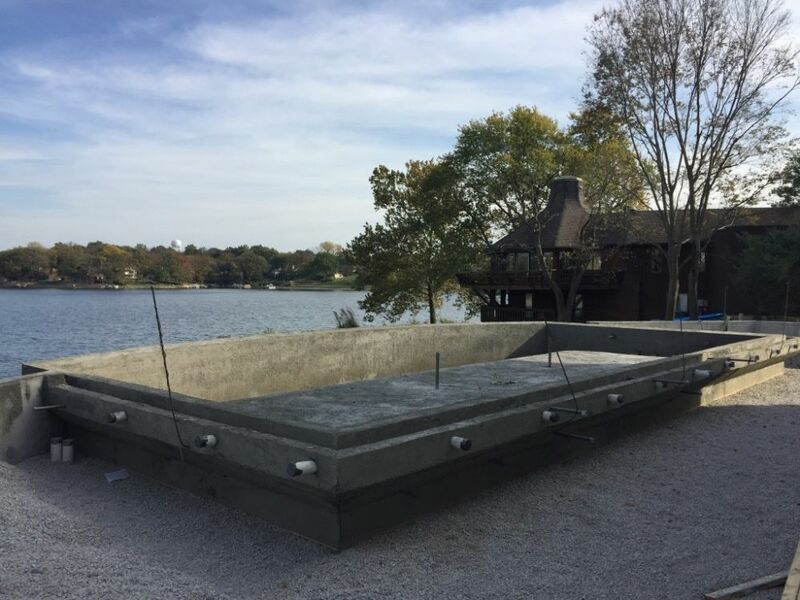 With everything settled, we went to work on site armed with a soils report that led us to build what we called a “containment wall” – a structure intended to cleat the foundation of the pool into the hillside while also tying it physically to the home. 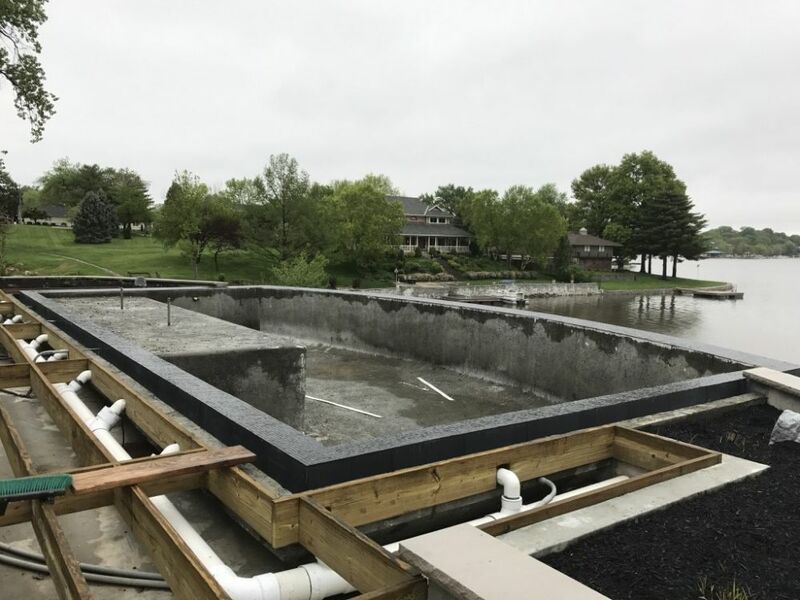 Within this perimeter, which effectively isolated the pool from any influence of the lake, we were able to insert a structural gravel fill to support the shell. Working on site was comfortable, with generally easy access. 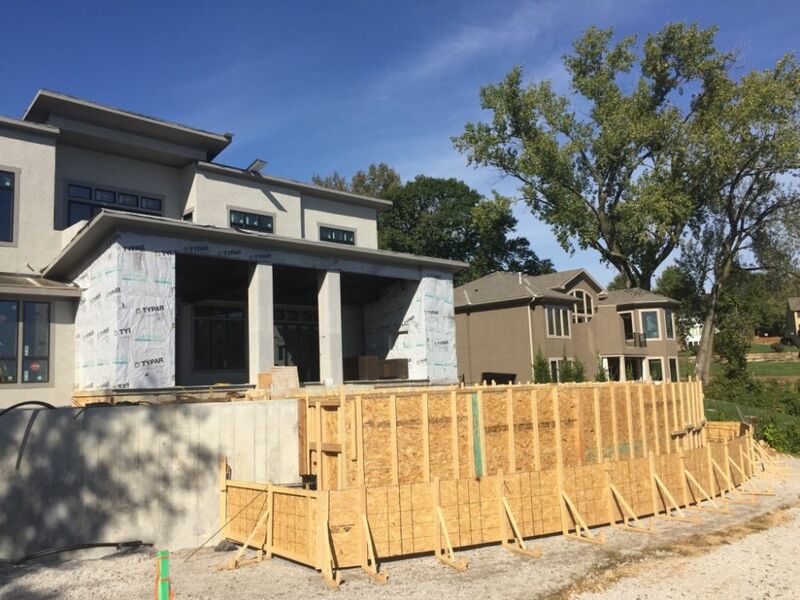 The main problem was logistical: With our crews and the various other crews working on the house, we outstripped the capacity of on-site parking and had to figure out ways to accommodate a large number of vehicles without unduly inconveniencing the neighbors. 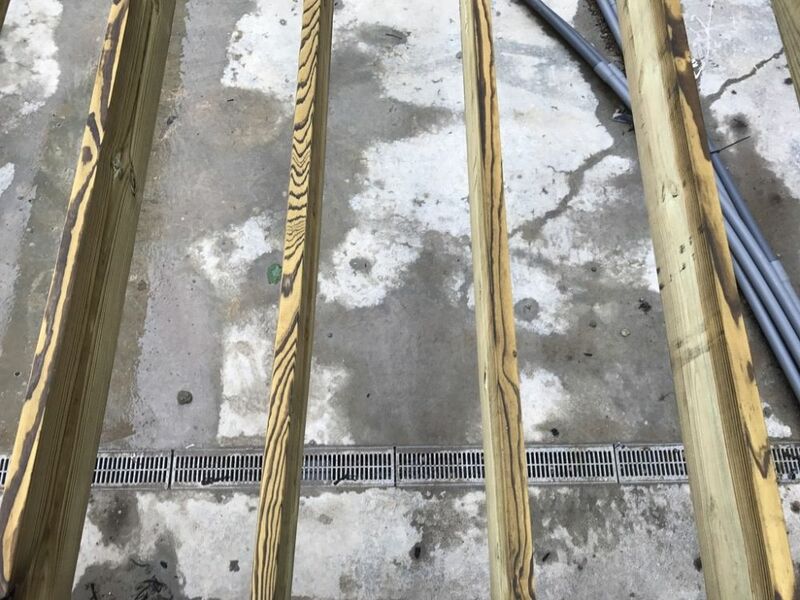 Framing for vanishing edges and perimeter-overflow details is always complex and involves a startling amount of substantial lumber, but we know that spending time here in getting things right will save us a great deal of time and labor down the line. 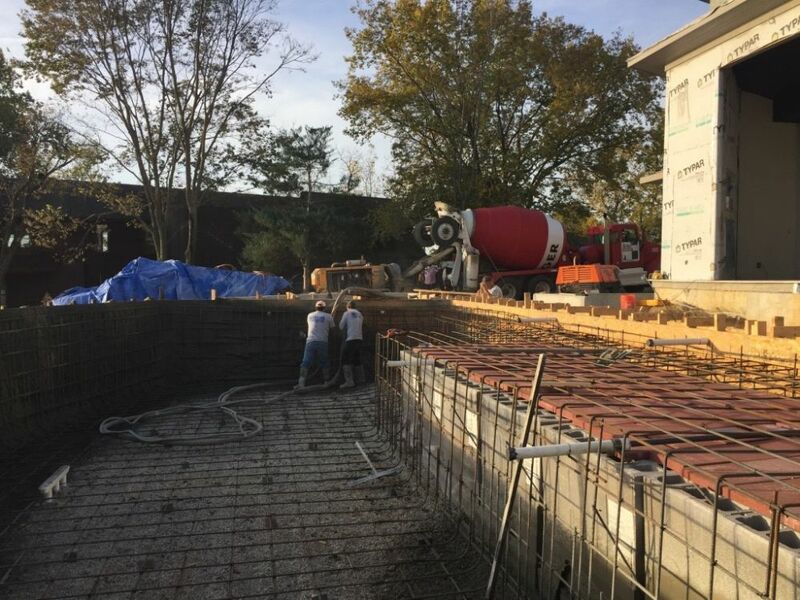 The clay tiles seen at middle right are covering the concrete masonry units we stacked within the shell to provide the base for a large shallow lounging area. There was also an overhead power line that ran from a temporary service pole to the house: Although we knew it would be moved once the home was complete, we spent an unusual amount of time working around it, particularly during the excavation process. When we began digging, we soon found that we needed to remove more soil than anyone had anticipated to get down to a suitable foundation. 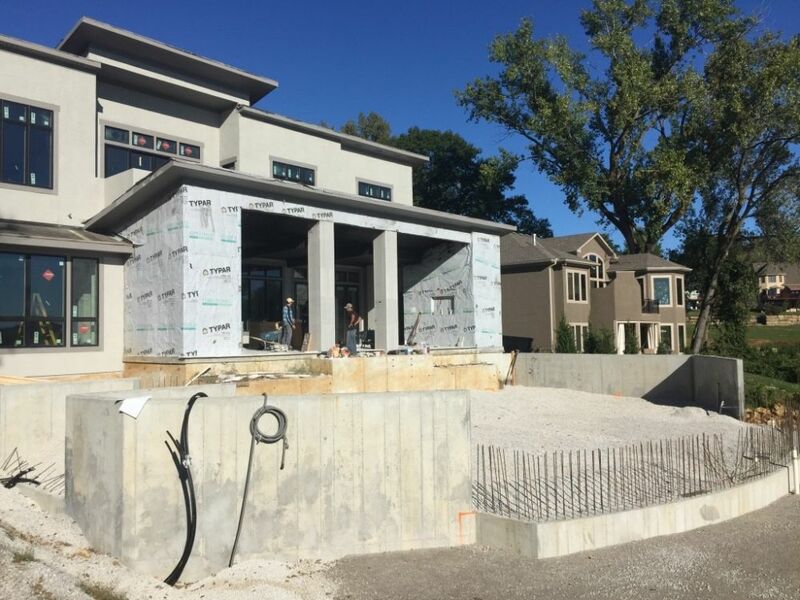 This required deeper footings and more interactions with the home builder, who was reluctant to get involved in any way with our part of the project. This was a snarl we untangled by working directly with the foundation contractor – problem solved! Applying concrete to the structure made for a long day given the amount of detail in the structure as well as its relatively large size. The process went smoothly, however, and the trimmed surfaces were well prepared for tile and plaster application when the time came – which, in this case, was quite a while as we waited for the general contractor to give us the green light to tackle our next tasks. Beyond that, the construction process was smooth sailing, although we did experience some weather-related delays and also experienced a good bit of starting and stopping related to what was going on with the house. That’s why our part of the project took ten months from start to finish. It’s also why we didn’t complete our work until deadline day: Some of what we had to do late in the process couldn’t be done until the builder gave us the green light. For a while now, we’ve used drones to record our work once a project is complete. But lately, we’ve taken to using this technology in another way that’s proving just as valuable: We’re now sending up the drones as a pre-design step, and we’re finding that it gives us a better handle on context. It’s all part of our belief that any worthwhile project has two clients: The one who hires us and the land we’ve been invited to shape. The pool’s interior mosaic tile came from Sicis (Ravenna, Italy), with a local supplier providing the large-format black lava tile, a porcelain product that came in 12-by-24-inch pieces. The clients selected the tile and plaster colors based on their review of our portfolio. Our main contribution here was insistently guiding them toward darker colors that would enhance reflections off the water’s surface. We didn’t select the furnishings, but here again, the clients made their choices with an eye toward what they’d seen in images we’d shared with them. In this case, they also specifically referred for inspiration to the design video (linked below) we had prepared as part of our presentation package. 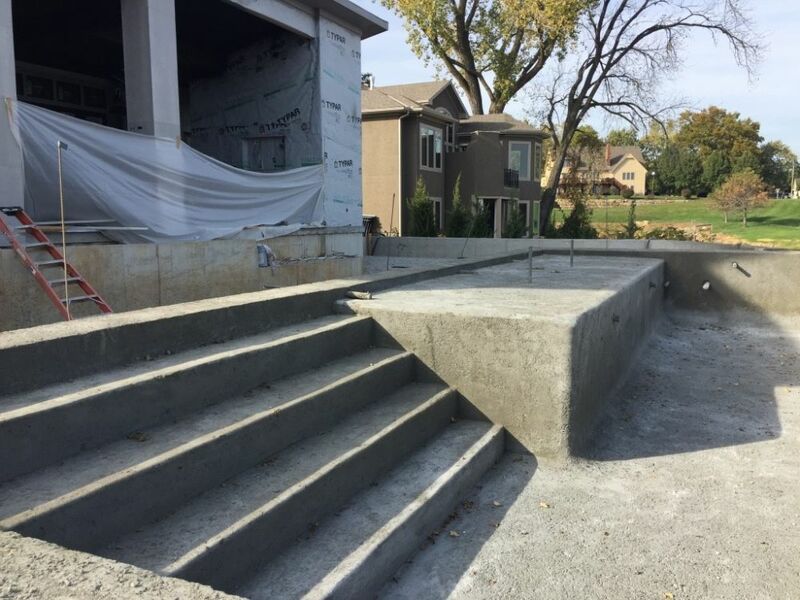 Every project has its lessons to teach, and in this case the main one had to do with standing by certain details we wanted to include in this particular yard. In many of our projects, for example, we use a coffer-type system for on-grade or slightly out-of-grade deck systems. It’s basically a big concrete box that keeps rodents from taking up residence beneath the decking while allowing water to pass through the surface and flow to a large-capacity drainage system while maintaining a greater-than-adequate airflow. It’s not the cheapest approach, but it ensures the long-time performance of a beautiful wooden deck. 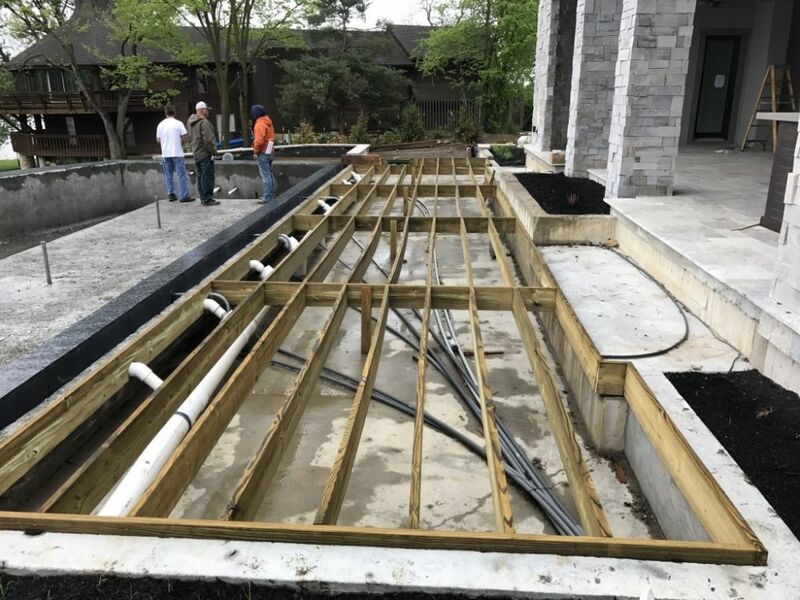 The coffer system we installed between the pool and the patio offered advantages that went well beyond providing stable underpinnings for the wood deck. 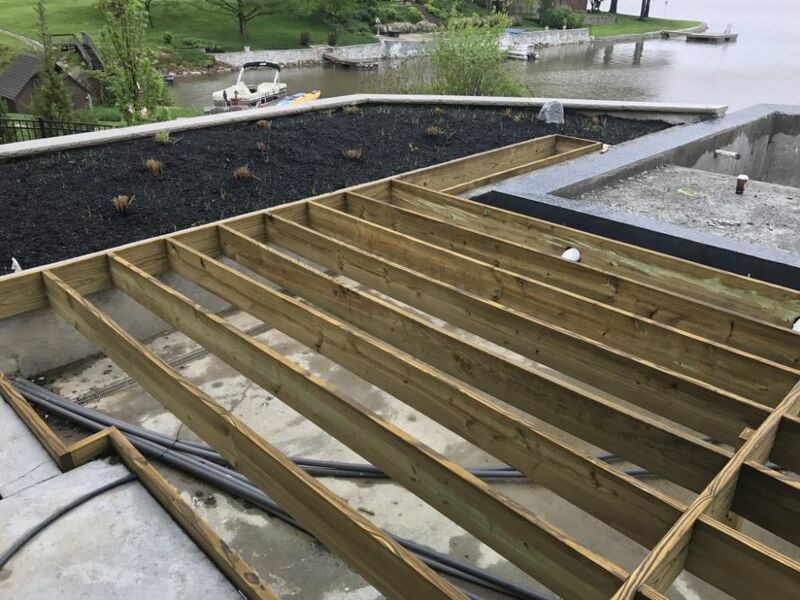 For one, it provided air circulation that will extend the life of the deck, but it also left us with a secure, ample sub-deck drainage system as well as a clear space in which we could run lighting conduits and place pipes for the perimeter-overflow system. It was that sort of detail and an accompanying need for precision that kept us on our toes as we coordinated activities on site. Perimeter-overflow systems are tough enough, but in this case we also had the containment wall, the coffer system, a vanishing edge and a long list of premium materials to work with on an unpredictable schedule. Coordinating subcontractors alone was an unusually big and important part of the job. The logistics for this project may have been intense, but the results reveal none of the complexities we faced on site. The views from every angle are greatly satisfying, even when you turn your back on the water-on-water views and look up at the house. And the serenity comes through whether it’s daytime, nighttime or – my favorite in this case – a beautiful sunset. But the upshot is that we hit our deadline – and that the clients love the outcome. We know this because they turned our post-completion photo shoot into a party and fell over themselves to congratulate us for the way we’d made it all so seamless; for the small details that made the project stand out from anything found in the area; and for the way we’d delivered on the full potential of their views across the pool to the lake beyond. This is one of those cases where it’s really fun to go back and look at the design video, mostly because of how close the end result is to what we’d planned from the start. 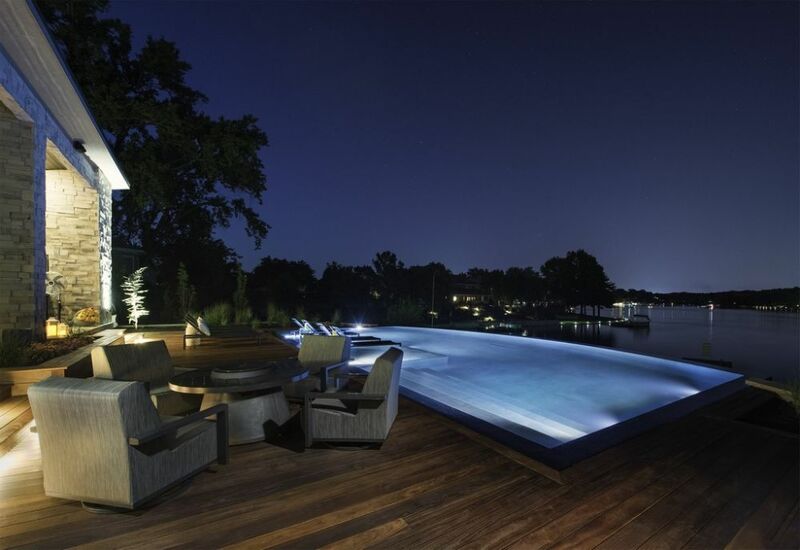 For the umpteenth time, this proved the value of the collaboration between Lorax Design Group and Liquify Pools: We focus on a shared vision and polish our projects to the last, perfected detail – all in a day’s work! To see a brief video I used in presenting the project to my clients, click here.